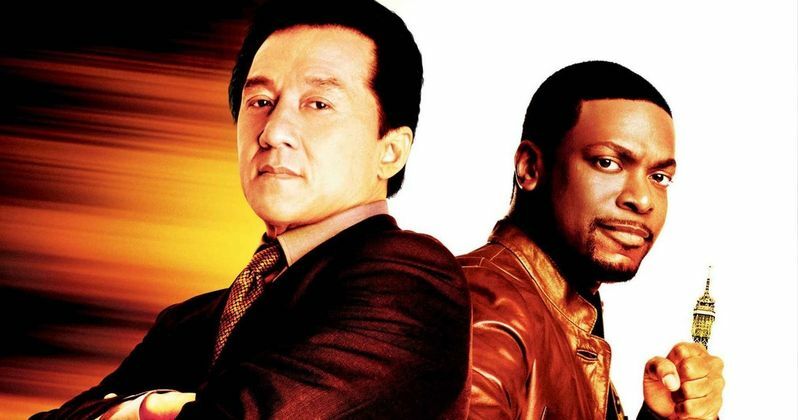 It's been more than a decade since Rush Hour 3 hit theaters, and there are still fans waiting for Rush Hour 4 to bring Chris Tucker and Jackie Chan back together. Those fans may get their wish soon, since Jackie Chan just revealed in a new interview that both he and his fellow Rush Hour franchise star Chris Tucker are getting ready to meet the director, with production possibly starting at some point next year. Here's what the action legend had to say below. "Good news. Next year, Rush Hour 4, and I hope the script done. And day after tomorrow we meet the director and Chris Tucker again to make sure we go the right track." While Jackie Chan wouldn't mention the director by name, it's quite possible that he's referring to Rush Hour franchise director Brett Ratner, who directed all three movies thus far, and even revealed in March that he's still talking to writers about a Rush Hour sequel. We also reported in August that Brett Ratner was set to produce a Hugh Hefner biopic, although he is not directing. The filmmaker has taken an extended hiatus from directing, having not taken the helm of a feature film since the underperforming 2014 action-adventure Hercules. While there is no indication that Brett Ratner would be directing this Rush Hour sequel, since these movies are his biggest hits as a director, it wouldn't be surprising to see him return to the helm for this fourth adventure. There has been talk of a fourth Rush Hour sequel ever since the third movie hit theaters a decade ago, and while there seems to be movement on the project every few years or so, it never comes to fruition. While the franchise is certainly steeped in box office prowess, the third installment sagged quite a bit from its predecessors, which could be one of the reasons this project has failed to move forward over the years. The first Rush Hour, starring both Chris Tucker and Jackie Chan as their careers were on the rise, was a huge box office blockbuster, earning $141.1 million domestic and $244.4 million worldwide, from a $33 million budget. The domestic mark good for the seventh highest-grossing box office total of the year. The 2001 sequel Rush Hour 2 took in $226.1 domestic and $347.3 million worldwide from a $90 million budget. The third movie took a bit longer to put together, arriving in theaters in 2007, although it couldn't reclaim its predecessors' box office glory. It earned $140.1 million domestic, just under the original, with $258 million worldwide from a ballooning $140 million budget. Jackie Chan wouldn't divulge any specifics about the fourth Rush Hour movie in his interview with the San Francisco Chronicle, but perhaps the time is right to make this sequel happen. You may recall that the producers did try to bring this franchise to the small screen with a Rush Hour TV series on CBS, which starred Justin Hires and John Foo as the two main characters. The show only lasted one season on CBS before getting cancelled. Hopefully we'll have more on Rush Hour 4 soon, but until then, take a look at Jackie Chan's full interview with the San Francisco Chronicle for his new film The Foreigner.